Greetings everyone! I’ve had so little time to stamp in the past month. We’ve had family visiting, a lot of family celebrations, and a lot of things I’ve needed to take care of at work. All really great things, but they sure add up to a lot of time otherwise invested. I appreciate your patience as I get back into my stamping groove :) Today I took a few minutes to put together a cute, clean and simple design with some new The Cat’s Pajamas dies. It’s all for our new TCP Challenge, Sand, Sea and Sky! Perfect timing for those warm summer days ahead. Here's a dreamy little ocean scene that looks very inviting right about now, doesn’t it? 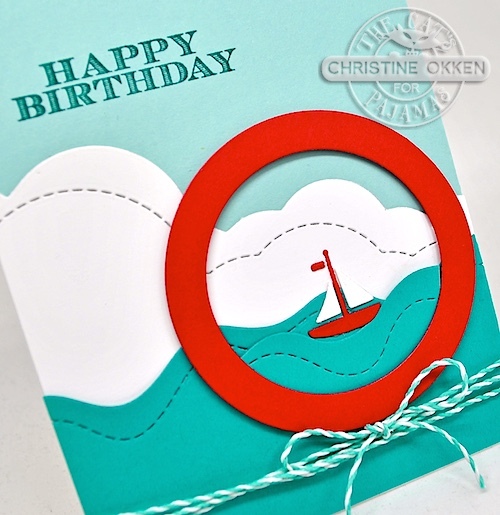 I combined several new TCP dies including: Beaches CutUps die, which includes the pretty stitched waves and the awesome sailboat. Next I added the Clouds and Balloons die, in the background, and highlighted the little sail boat with a Framed Up 2 CutUps circle. Some twine finishes off the bottom, and the sentiment comes from TCP’s set, Simply Stacked Sentiments. So come on in and join in the Sand, Sea and Sky Challenge this month! Alma’s UPPED the ante and has made this month long challenge worth a $50 Cat’s Cash Voucher! Every Release Tuesday a new challenge will be posted on The Cat’s Pajamas blog and our Facebook page. If you want to play along you just upload your design to The Cat’s Pajamas blog page using the InLinkz button by, 11:55 EDT the day before the next challenge. You are not required to use a Cat’s Pajamas stamp or die but if you have them we would love to see them. On the day after the challenge ends, the winner will be chosen from the previous challenge and will receive a Cat Cash Voucher for $50. 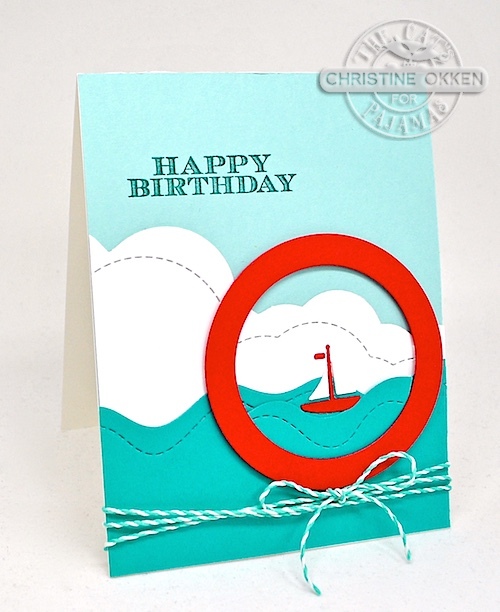 I love the all cardstock look - beautiful card.